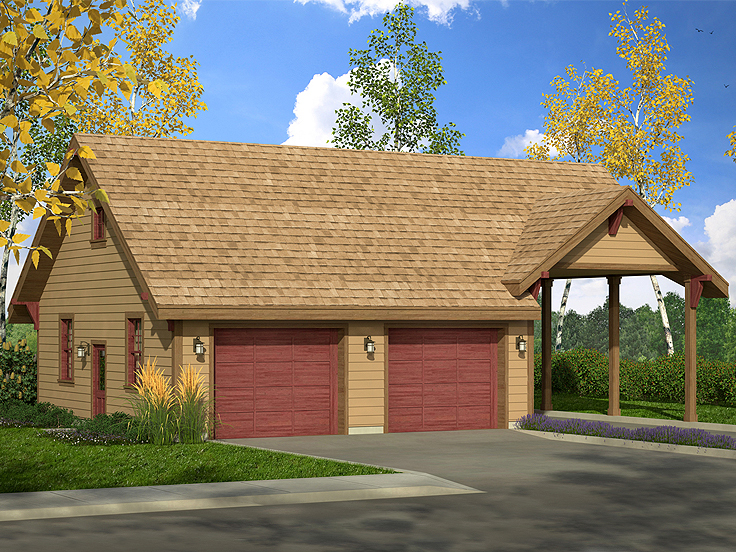 Now Featuring Some of Our Newest Garage Plans! 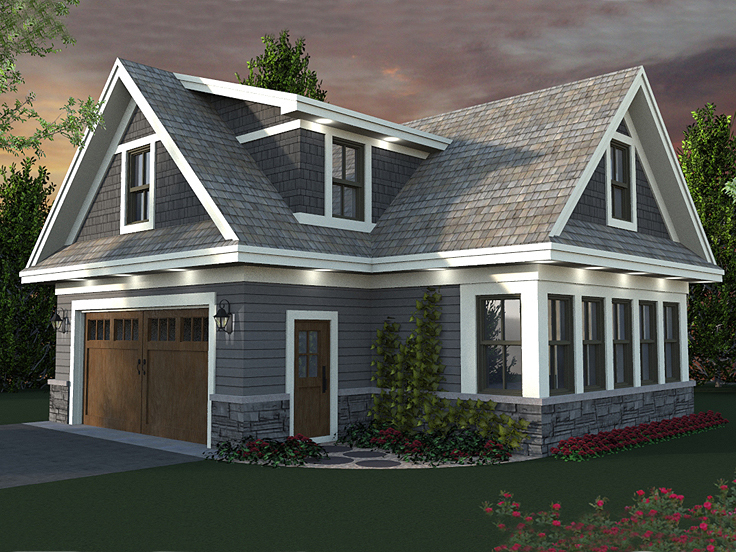 The Garage Plan Shop is currently featuring some of our newest garage plans. 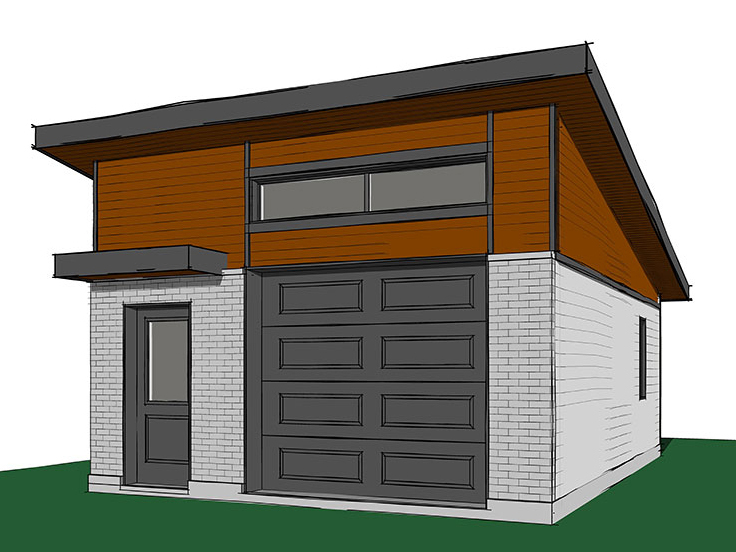 We continuously add new plans to our site, so we are taking this opportunity to feature some of the new garage plans that were added to our website within the last six months. These plans range in size and offer various architectural styles and features. 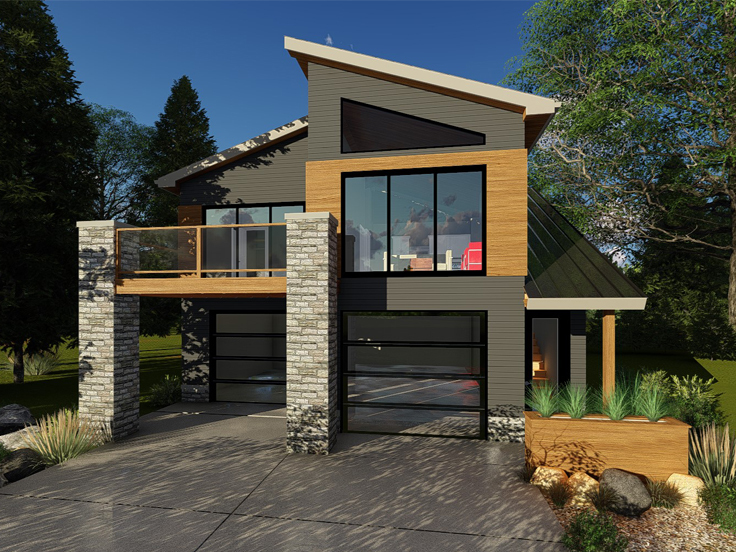 Some of our new garage plans are modern, country or European in design. Additionally, some are garage apartment plans with living quarters above and others are simple designs that only offer parking. 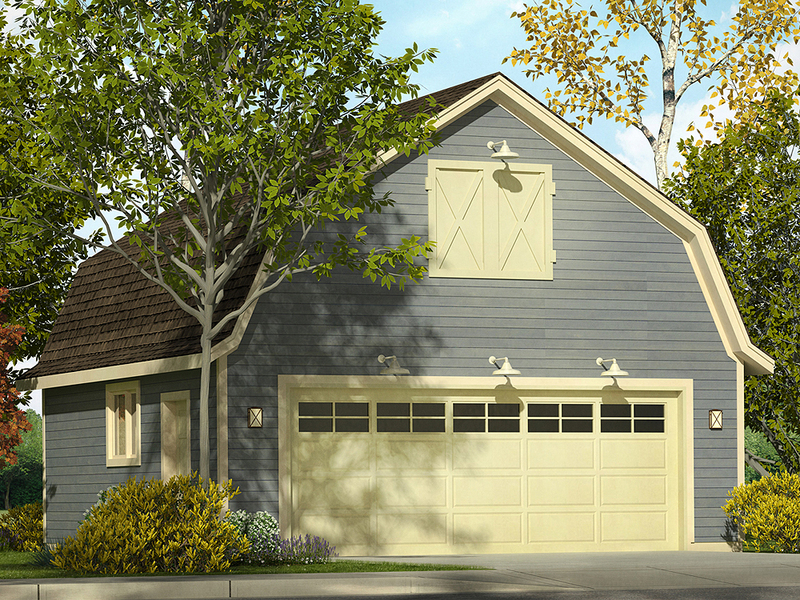 Take some time to review these six new garage plans. 006G-0171 – Is this a two-car garage with an apartment above it, or is it a sweet two-bedroom apartment with a two-car garage underneath? Exactly! It is both! This garage apartment plan is a great living solution for housing extended family, frequent guests, hired help or boarders. With great efficiency, the living area includes not only two bedrooms and two full baths, but an open floor plan with living and kitchen areas plus a laundry. Both interior and exterior stairs access the apartment with its relaxing wrap-around deck. The garage level delivers, two bays for parking plus a shop area for the family handy man and a storm shelter. 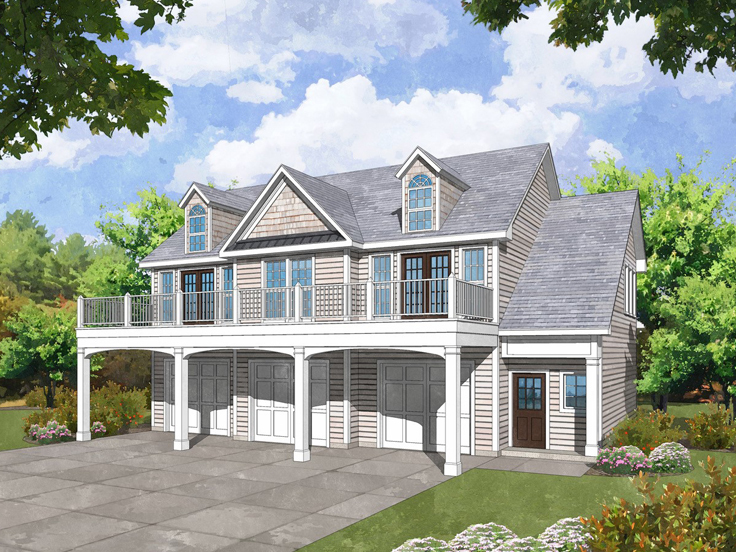 Ideal for a vacation home or a backyard garage apartment plan, this design has more to offer than you might expect! 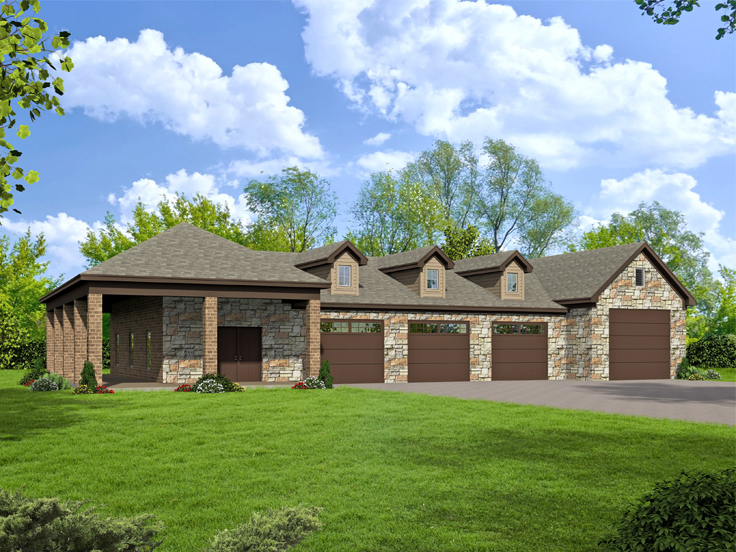 009G-0008 – Designed with country traditional styling, this 3-car garage plan is sure to be a great addition to most residences. Whether you need to add more parking for the growing family fleet or you need extra storage space for the riding lawn mower, ATV, or motorcycle, this spacious garage is sure to accommodate you. A protected side porch offers a place to prepare dinner on the grill or sit back, kick up your feet and relax. 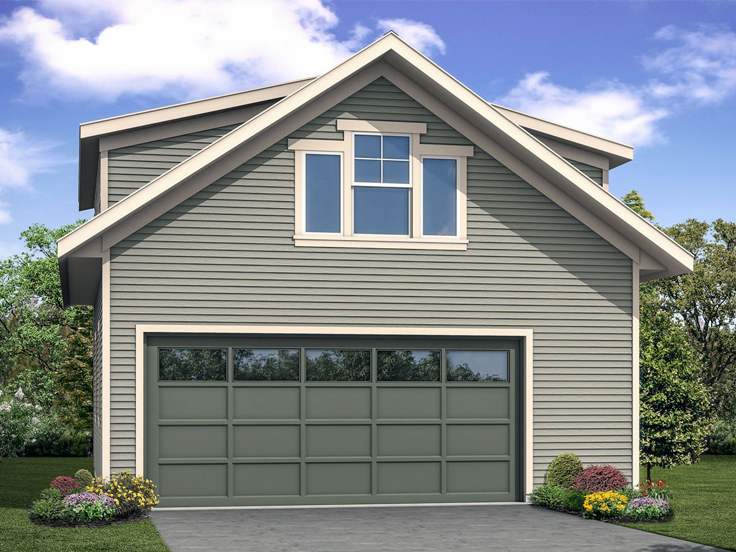 Add practical space and value to your home with this detached, 3-car garage. 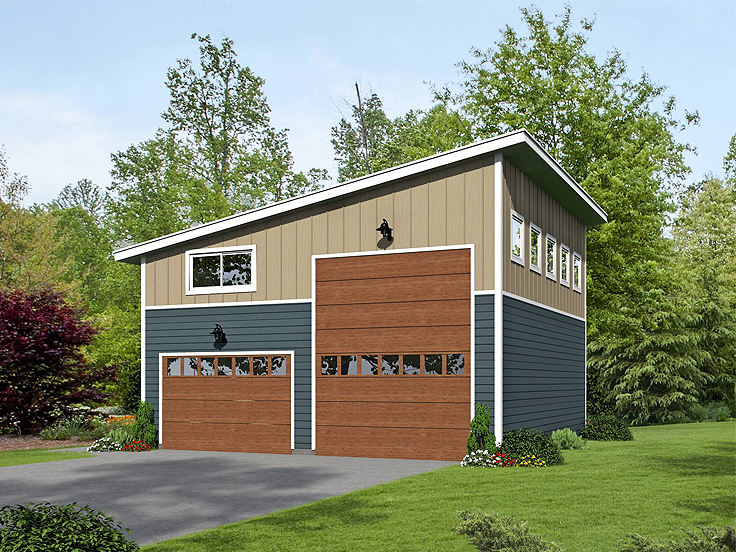 034G-0023 – This modern garage workshop plan is a great accompaniment for any modern or contemporary residence. It offers a flexible design that can be used entirely as a workshop, entirely as a garage, or a little bit of both. A row of protected windows let natural light spill into the vaulted double bay. Handy cabinets located underneath offer convenient storage for tools and parts. There is a workbench along the back wall and full bathroom for keeping the home mechanic clean. 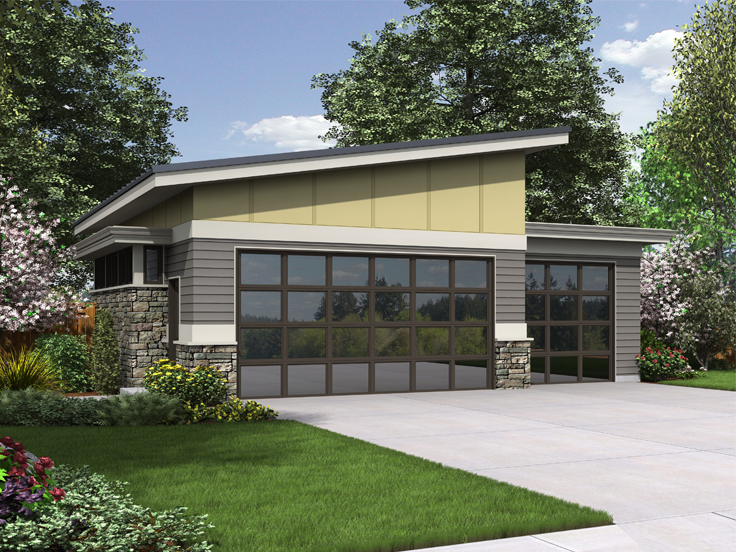 Featuring 1136 square feet of usable space, this garage plan with workshop is sure to dress up your modern home! 051G-0098 – Need extra parking for usable space? 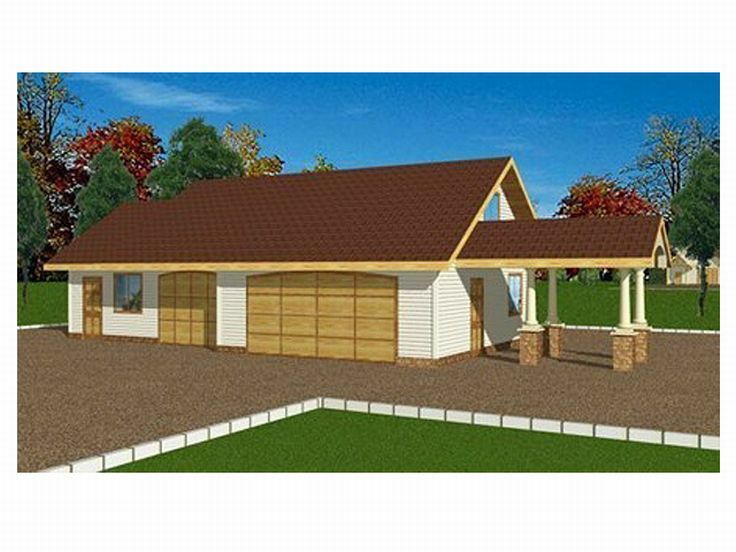 Take a look at this two-car garage plan with RV carport. The double garage is extra deep making is suitable for boat storage. And with the drive-thru bay, boat storage is easy! The rear overhead door is also handy for accessing lawn and garden equipment if you prefer. The carport bay offers a 12’ ceiling which is suitable for storing some RVs or campers. 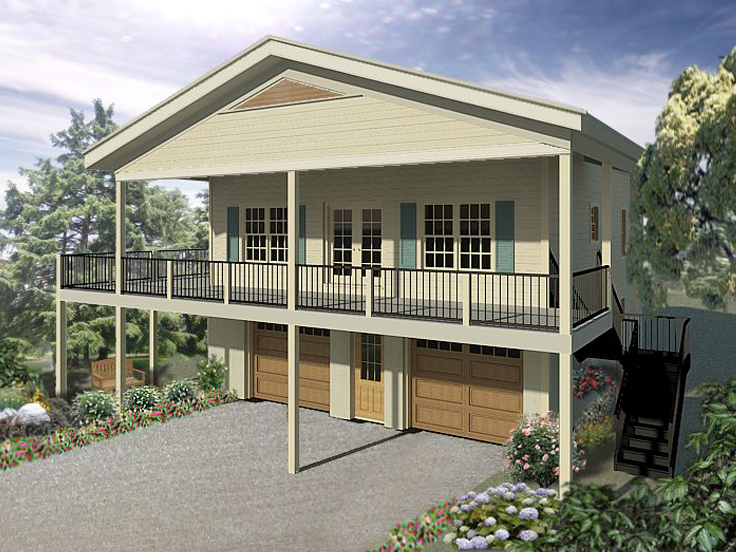 Protect your investments for the elements with this two-car garage plan with RV carport. 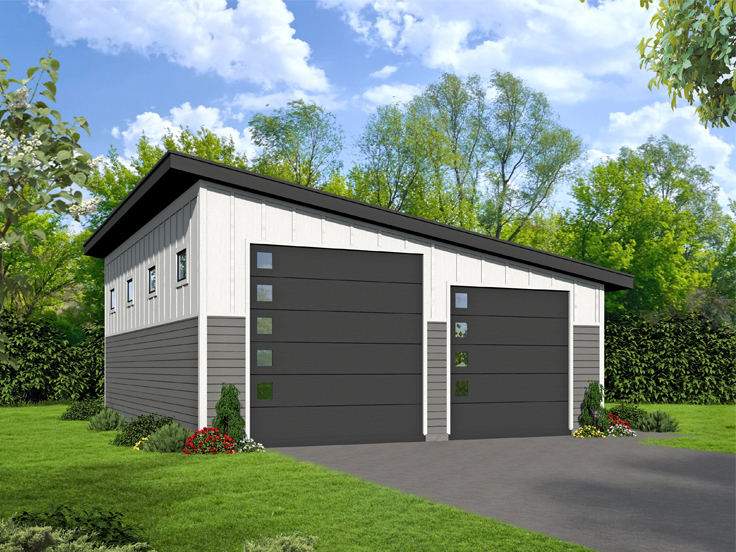 062G-0083 – This garage apartment plan is distinctly modern. The exterior features clean lines and minimal details. Interior stairs access the living area. Notice the security of a separate door for the garage bay making this plan an ideal design for rental property. 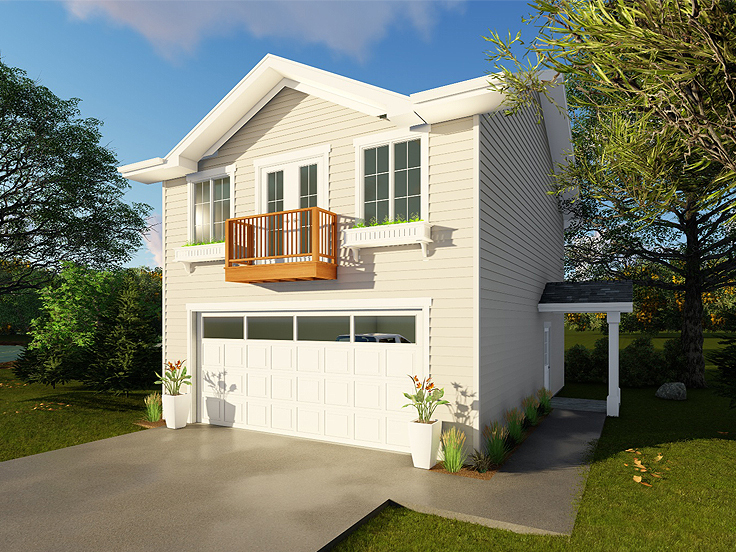 The renter will only have access to the living quarters while you can have access to the garage. Efficient living space provides room for all the essentials, even a stacked washer/dryer for laundry. Double doors open to a petite balcony perfect for viewing sunsets. Storage space is offered under the stairs and behind the vehicle in this one-car garage. 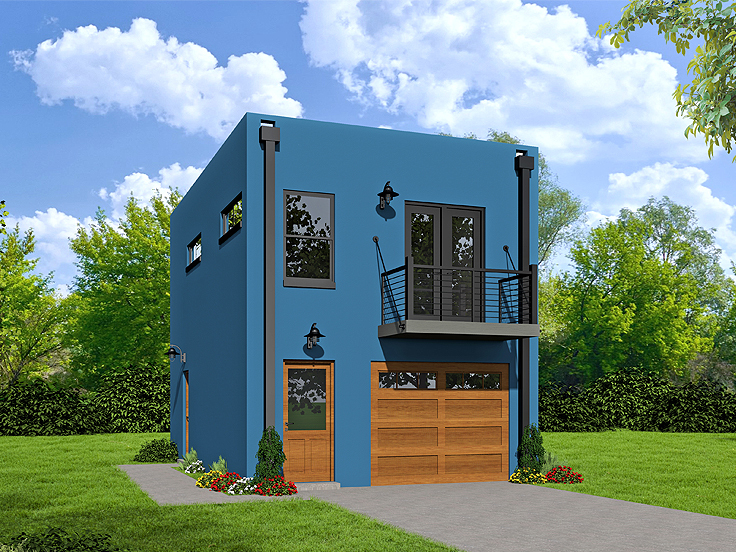 Compliment your modern home with this modern garage apartment plan! 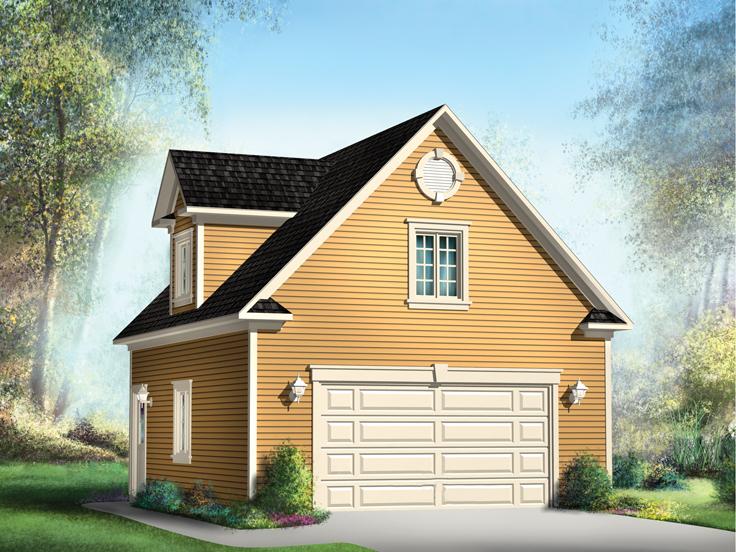 025G-0013 – Looking for a detached garage plan to blend with your European home? 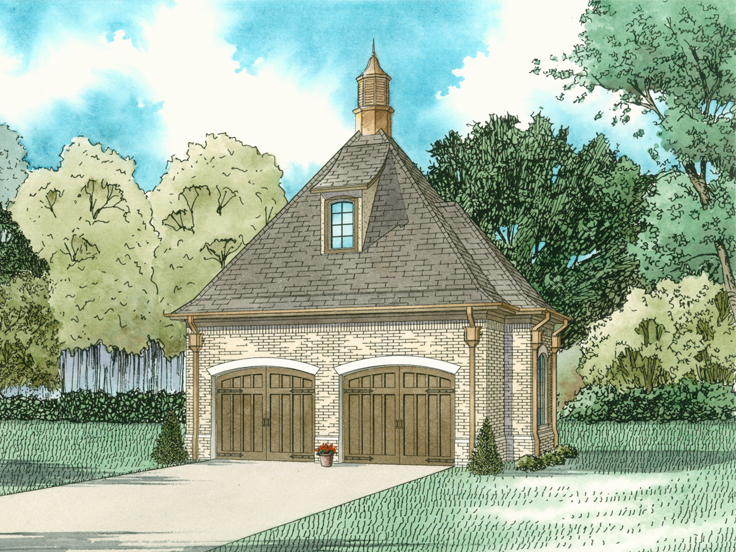 This European-style two-car garage plan proves that you don’t have to sacrifice character for utility. Yes, it is a very basic two-car garage with a bit of elbow room here and there, but that exterior is as well planned as any stately manor. Two separate gently arching doors are surrounded by handsome brick and stonework, and it’s topped off with its very own cupola. Enhance your backyard and add valuable parking to your home with this European two-car garage plan. 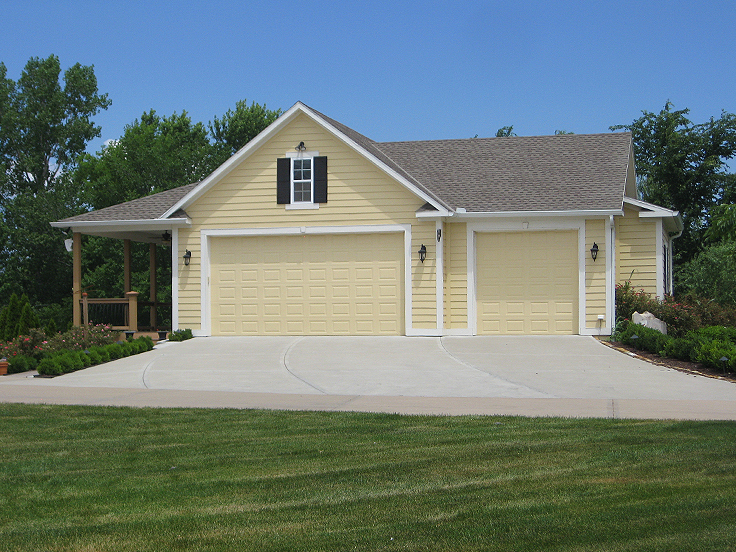 We are always adding new garage plans to our website. Check back often to discover more new garage plans like these.